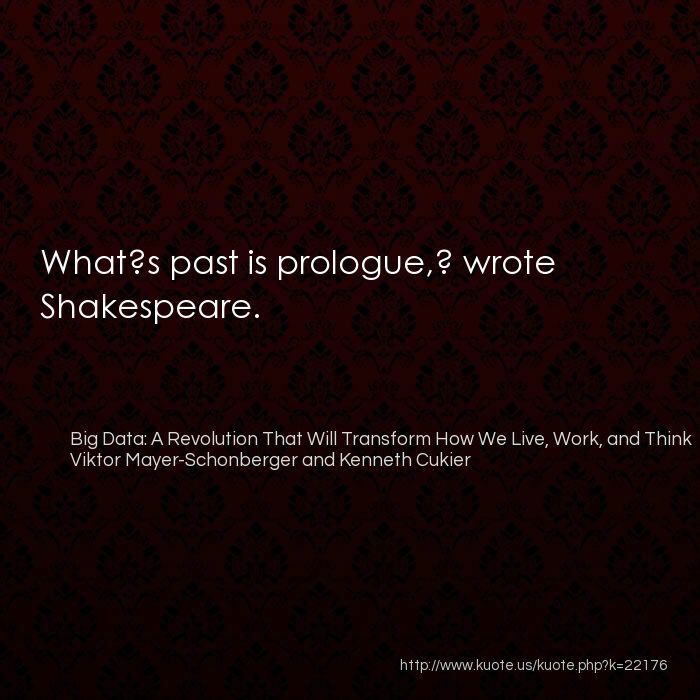 What?s past is prologue,? wrote Shakespeare. 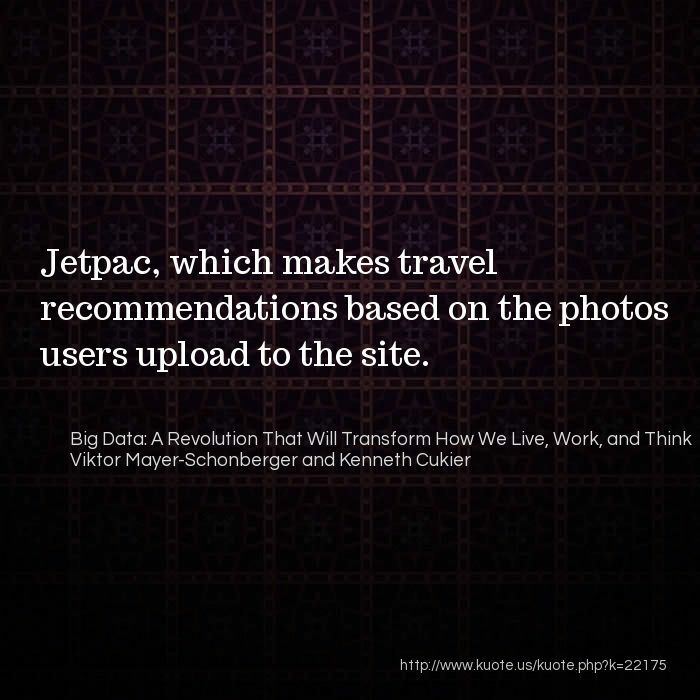 Jetpac, which makes travel recommendations based on the photos users upload to the site. 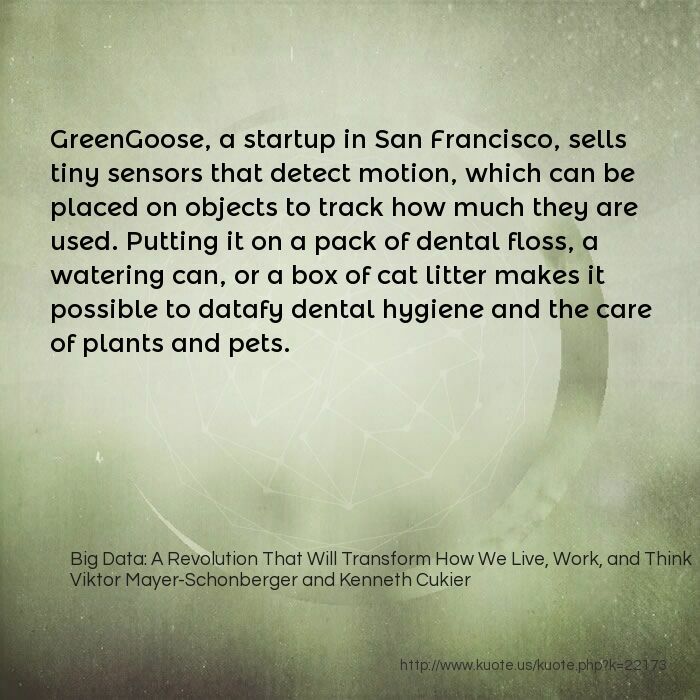 GreenGoose, a startup in San Francisco, sells tiny sensors that detect motion, which can be placed on objects to track how much they are used. Putting it on a pack of dental floss, a watering can, or a box of cat litter makes it possible to datafy dental hygiene and the care of plants and pets. 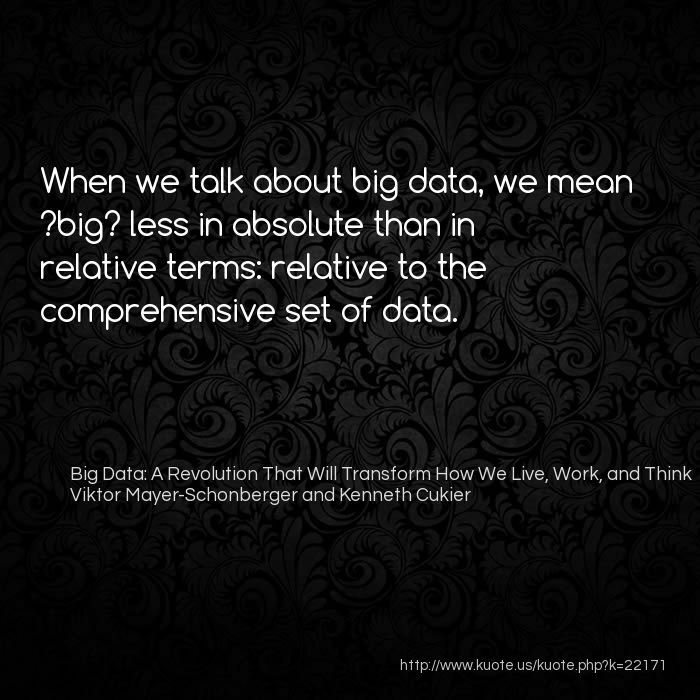 When we talk about big data, we mean ?big? less in absolute than in relative terms: relative to the comprehensive set of data. 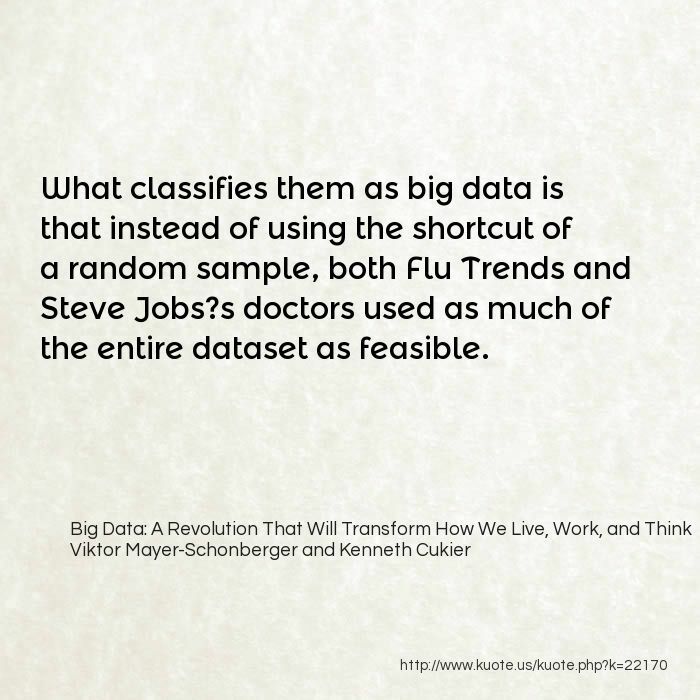 What classifies them as big data is that instead of using the shortcut of a random sample, both Flu Trends and Steve Jobs?s doctors used as much of the entire dataset as feasible. 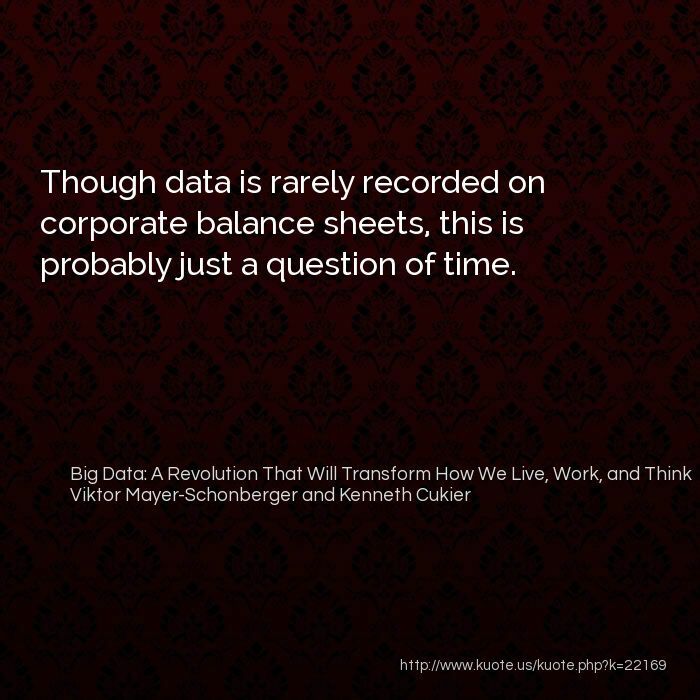 Though data is rarely recorded on corporate balance sheets, this is probably just a question of time. 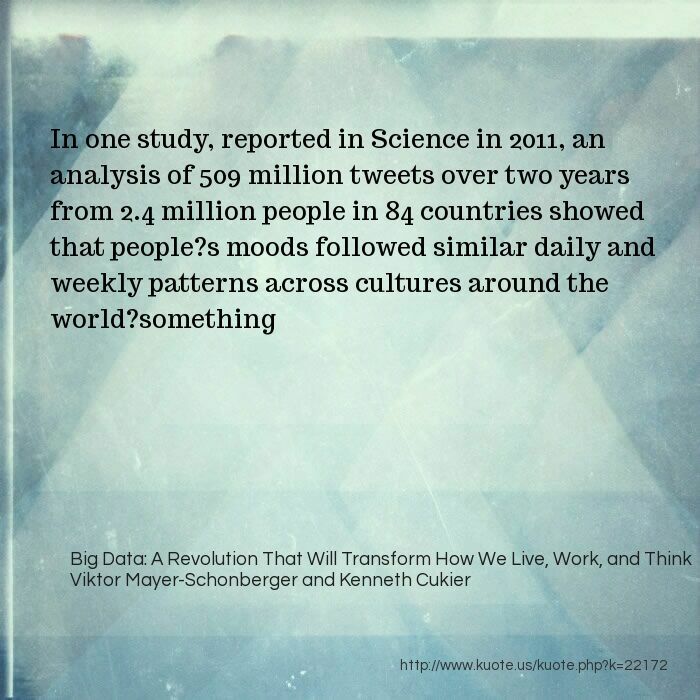 data is about what, not why. 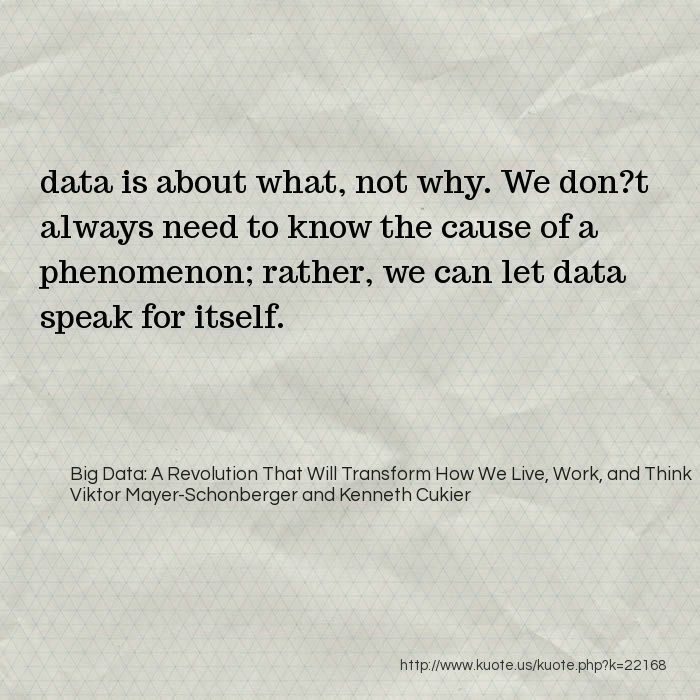 We don?t always need to know the cause of a phenomenon; rather, we can let data speak for itself. 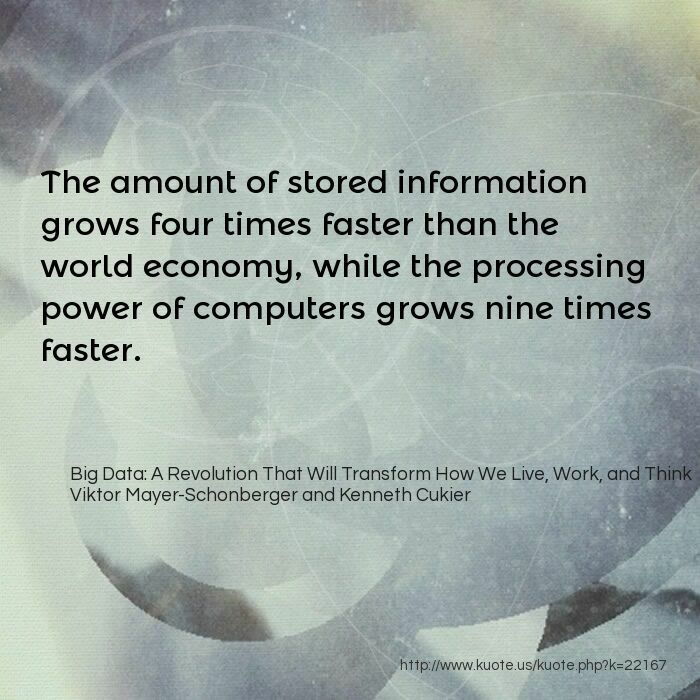 The amount of stored information grows four times faster than the world economy, while the processing power of computers grows nine times faster. 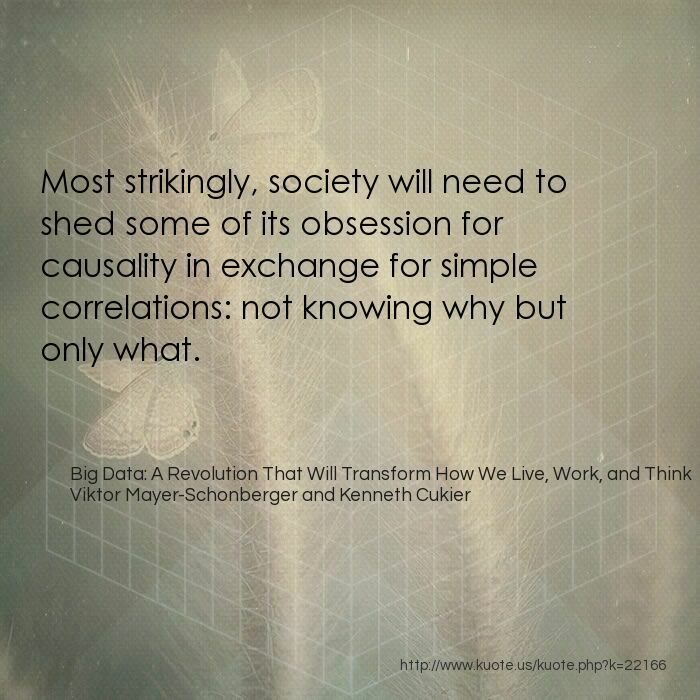 Most strikingly, society will need to shed some of its obsession for causality in exchange for simple correlations: not knowing why but only what. 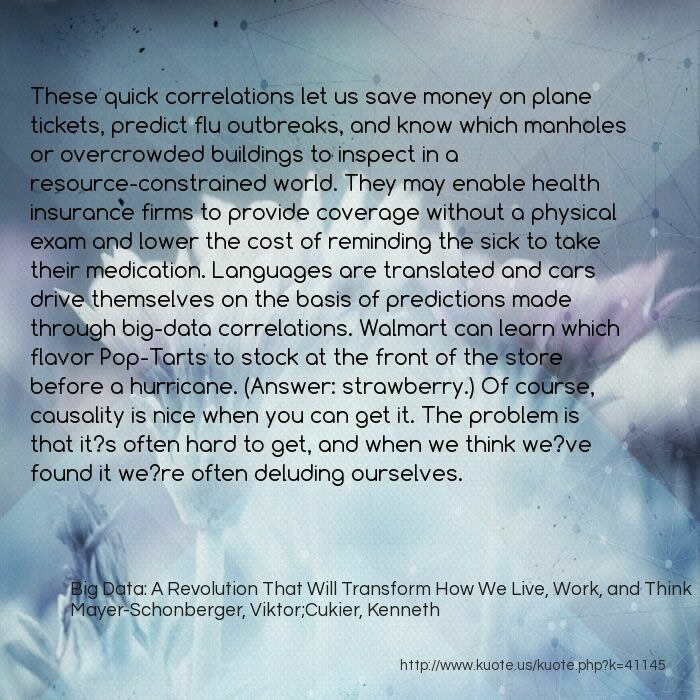 These quick correlations let us save money on plane tickets, predict flu outbreaks, and know which manholes or overcrowded buildings to inspect in a resource-constrained world. They may enable health insurance firms to provide coverage without a physical exam and lower the cost of reminding the sick to take their medication. Languages are translated and cars drive themselves on the basis of predictions made through big-data correlations. Walmart can learn which flavor Pop-Tarts to stock at the front of the store before a hurricane. (Answer: strawberry.) Of course, causality is nice when you can get it. The problem is that it?s often hard to get, and when we think we?ve found it we?re often deluding ourselves. Prior to the big-data analysis, inspectors followed up the complaints they deemed most dire, but only in 13 percent of cases did they find conditions severe enough to warrant a vacate order. Now they were issuing vacate orders on more than 70 percent of the buildings they inspected. 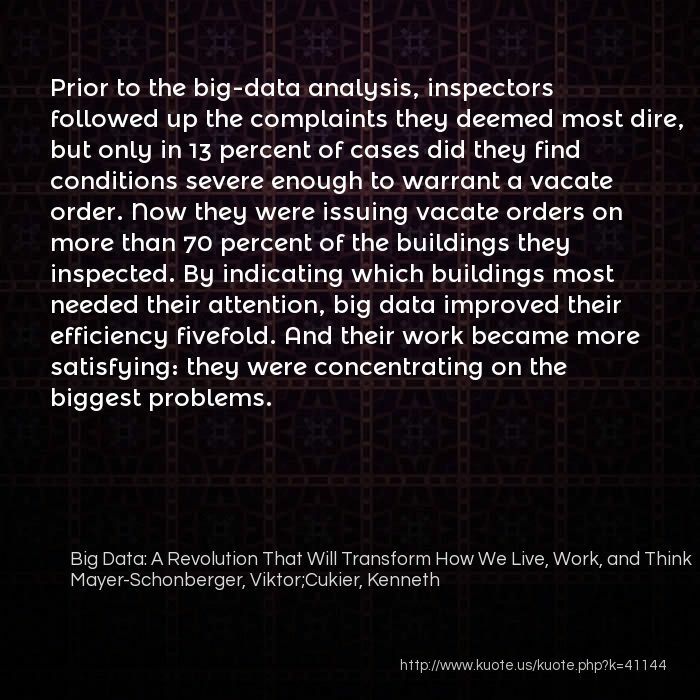 By indicating which buildings most needed their attention, big data improved their efficiency fivefold. And their work became more satisfying: they were concentrating on the biggest problems. problem that could be solved with lots of data. They started with a list of every property lot in the city?all 900,000 of them. 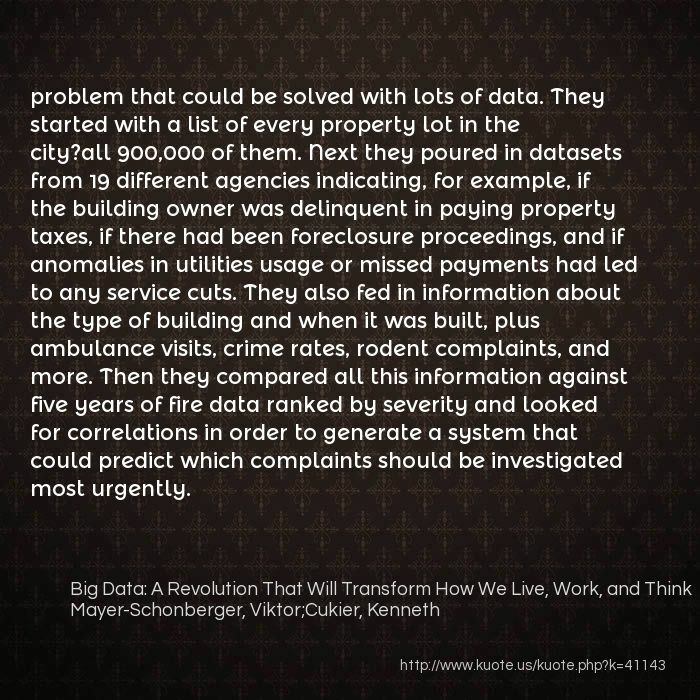 Next they poured in datasets from 19 different agencies indicating, for example, if the building owner was delinquent in paying property taxes, if there had been foreclosure proceedings, and if anomalies in utilities usage or missed payments had led to any service cuts. They also fed in information about the type of building and when it was built, plus ambulance visits, crime rates, rodent complaints, and more. Then they compared all this information against five years of fire data ranked by severity and looked for correlations in order to generate a system that could predict which complaints should be investigated most urgently. 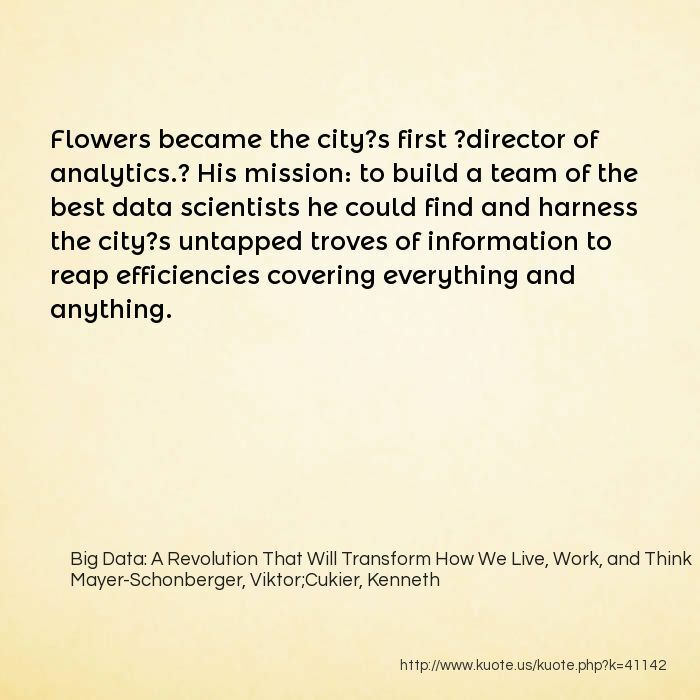 Flowers became the city?s first ?director of analytics.? 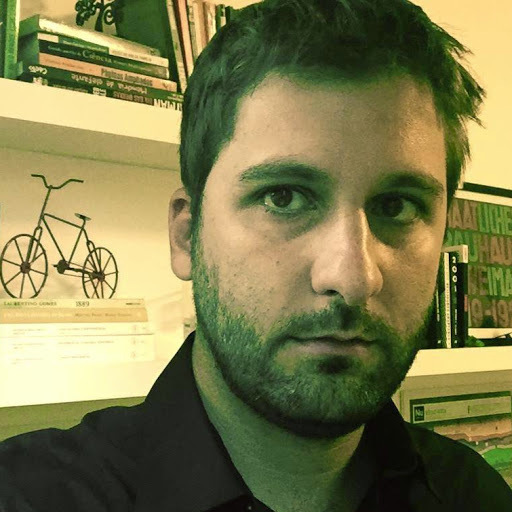 His mission: to build a team of the best data scientists he could find and harness the city?s untapped troves of information to reap efficiencies covering everything and anything. fundamental new strategies for big-data governance, regarding privacy, propensity, and algorithm auditing. 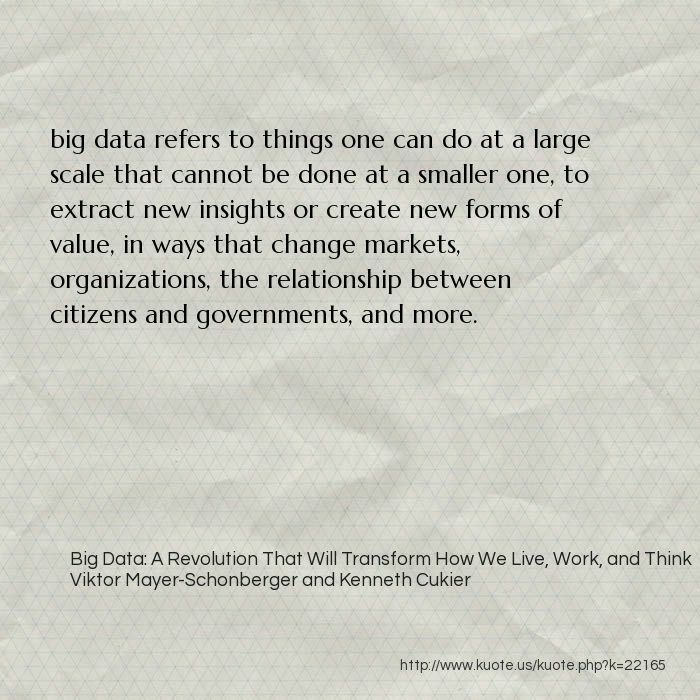 We?re confident that with these in place the dark side of big data will be contained. Google, as we?ve shown in many examples, runs everything according to data. That strategy has obviously led to much of its success. But it also trips up the company from time to time. 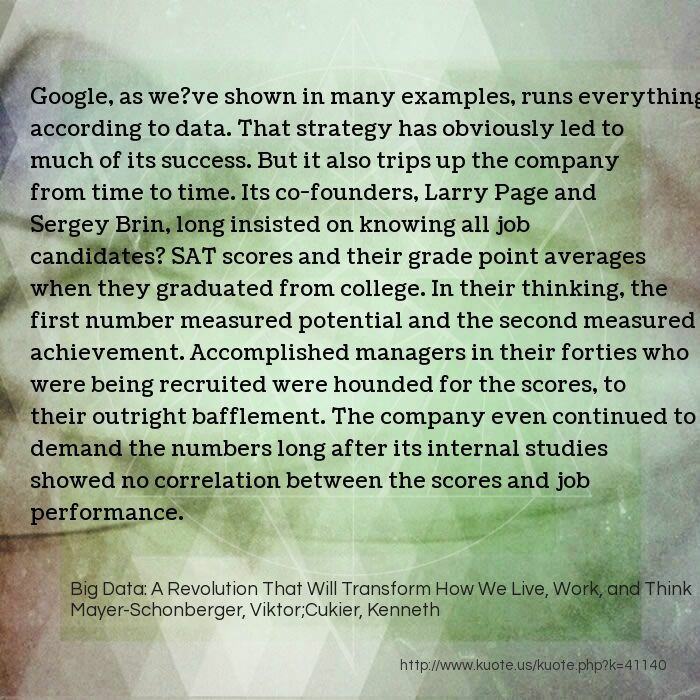 Its co-founders, Larry Page and Sergey Brin, long insisted on knowing all job candidates? SAT scores and their grade point averages when they graduated from college. In their thinking, the first number measured potential and the second measured achievement. Accomplished managers in their forties who were being recruited were hounded for the scores, to their outright bafflement. The company even continued to demand the numbers long after its internal studies showed no correlation between the scores and job performance. 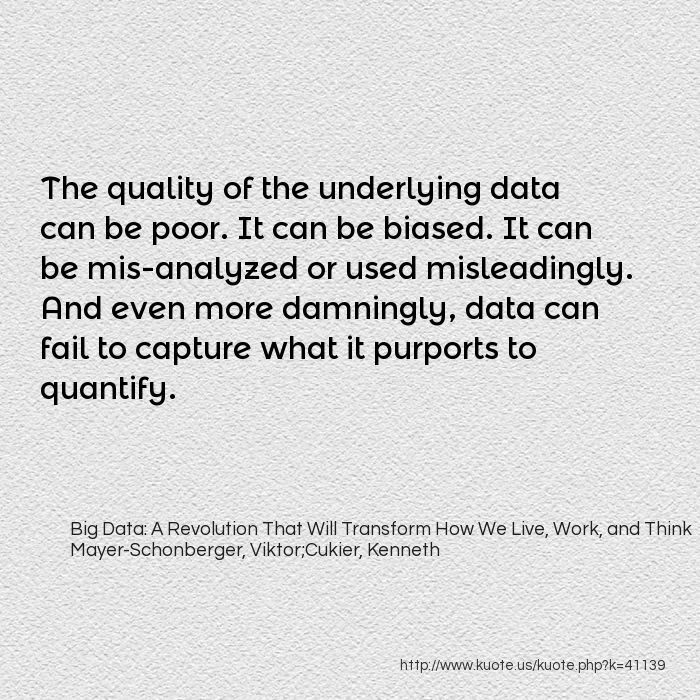 The quality of the underlying data can be poor. It can be biased. It can be mis-analyzed or used misleadingly. And even more damningly, data can fail to capture what it purports to quantify. Like the factory men at Ford who dumped engine parts into the river, junior officers sometimes gave their superiors impressive numbers to keep their commands or boost their careers?telling the higher-ups what they wanted to hear. McNamara and the men around him relied on the figures, fetishized them. 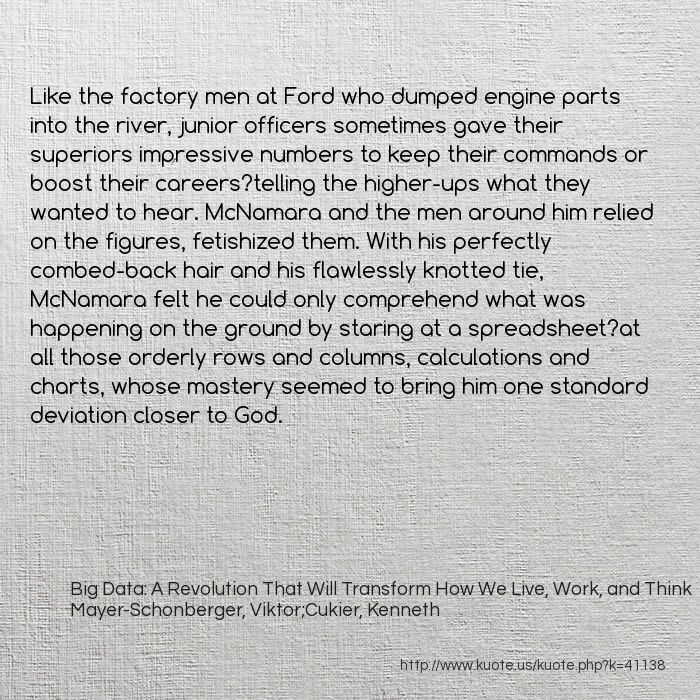 With his perfectly combed-back hair and his flawlessly knotted tie, McNamara felt he could only comprehend what was happening on the ground by staring at a spreadsheet?at all those orderly rows and columns, calculations and charts, whose mastery seemed to bring him one standard deviation closer to God.